Since 1984, manufacturer and supplier of specialty chemical products for construction, sanitary and industrial sector! CALLSTOP is the most effective and safe decalcifier to date. Pipes that have been affected by calcium deposits can lose up to 35% of their heat transferring capabilities; For these pipes, CALLSTOP provides an essential treatment. 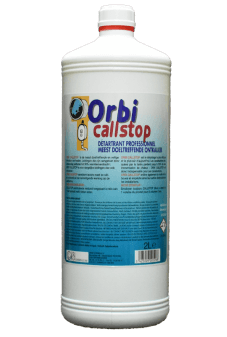 ORBI CALLSTOP removes rust and silt and neutralises their destructive effect on all appliances.